I was talking to my mom about the horseradish greens (after last week’s post) when a really good idea popped into my head: use them in a pistou-like sauce. 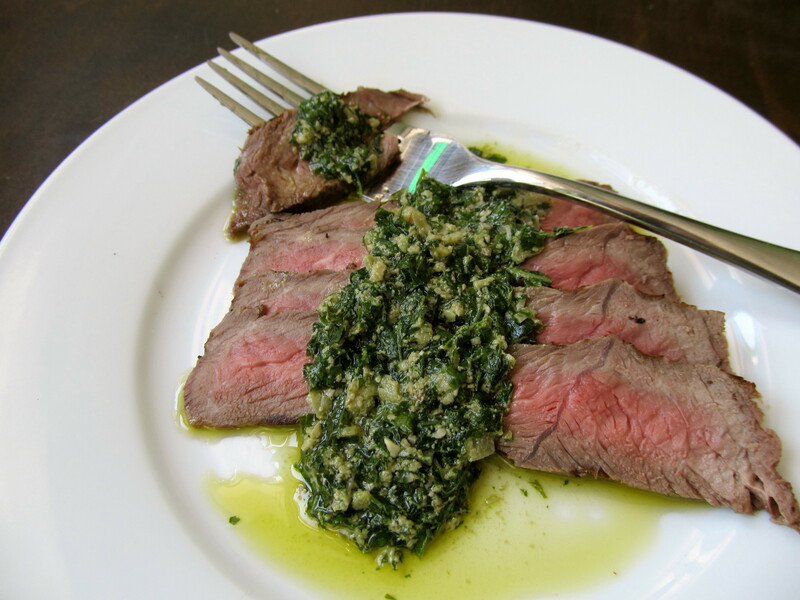 Prime rib and horseradish sauce are a classic pairing so I thought horseradish greens, which taste like horseradish, would go well with a nicely grilled steak in the form of an herb sauce. Over the weekend I had a great opportunity to turn the idea into a horseradish greens pistou and see how it turned out. Cheryl’s parents were visiting and it was her mother’s birthday on Saturday so we had a very nice cookout where I grilled up some steaks. Perfect chance to use the remaining horseradish greens I had in making a sauce for the meat. As I surmised, this effort turned out really well. How well? Let’s just say the bowl was practically licked clean. And I’m pretty sure we had leftover steak only because we ran out of the pistou and no one wanted steak without the sauce! I kept it very simple with the ingredients but added some shallots and red wine vinegar to try to balance the heat and bitterness of the horseradish greens with some sweetness and acid. I know some may quibble the addition of vinegar changes it from a pistou to more like a chimichurri but I think the walnuts qualify it for a pistou. I was really surprised at how well the walnuts go with the horseradish. They give it some body as well as an earthier flavor. Even though horseradish is a strong flavor the greens are much subtler than the root so you need to be careful when adding the walnuts. I recommend adding them to your mortar and pestle (or food processor) incrementally and tasting as you go since it’s much easier to add some more than it is to take some out. Using a mortar and pestle add a pinch of salt to the walnuts, garlic, and shallots, and pound into a paste. Add the horseradish leaves and continue mashing together until you’re left with much smaller horseradish leaves shredded. Add the olive oil and stir the paste in. Add the red wine vinegar and taste. Adjust seasonings and let sit for at least an hour. Do you think that you can make this without walnuts? It looks delicious, but I have a nut allergy. Yes, you can! Make it your own!